1. Take 8-10 vanilla beans (they don’t have to be high quality or expensive beans), slit them down the middle and with a knife scrape down to remove bean paste. Put paste in small glass jar. After removing paste cut the beans into small pieces and add to jar. 2. Pour enough vodka into jar to cover the chopped up vanilla beans. The alcohol will soak into the beans and absorb the rich vanilla scent. 3. Place jar somewhere dry and not too cold (some say it’s also better to store the jar in a dark place but I personally left it on the window sill in my kitchen). Let stand for anywhere from 3 weeks to 2 months depending on how strong a fragrance you want. Like I said before, the waiting was the hardest part. I opened that jar daily to see how the scent was absorbing and getting stronger. 4. When ready, strain the liquid from the vanilla pieces with a piece of cheesecloth, thin cotton or even ladies pantyhose (hate that word!). Put the strained liquid into a clean glass jar and pour in the jojoba oil (I used about 2 times the amount of oil than there was vanilla liquid). You can re-use the vanilla paste and beans to start a new batch of perfume as well. Just add in a few new beans and start the process from the beginning. 5. Make sure to store in a relatively cool and dry place in order for it to last longer (it should be good for at least several months). **Although I really like this scent I’m in the process of trying another method which skips using any sort of alcohol. I’m steeping the chopped beans and paste directly in the jojoba oil for several months. That way there won’t be a mixture that separates and has to be shaken before using. **If you can’t get Jojoba oil (or it’s too expensive) almond oil is supposed to be a great substitute. It’s my favourite scent too! And I also buy in the Body Shop! Maybe they have some more over here? I can have a look if you want? I love homemade perfume! I’ve done a lot of infused oils (jojoba is my favorite) so I have a tip you might want to try. If you put the oil and vanilla beans on the stove on VERY low heat and let it sit for a day or so (just turn off the stove if you leave the house or go to sleep) then you can get infused oil in about 24 hours! Then just strain it with cheesecloth like you normally would. Also, a tip for anyone in the U.S. looking for affordable jojoba oil: Trader Joe’s stores carry 4-ounce bottles for $8. It’s the best price I’ve found for good quality oil. Oh wow, I’ll have to try that method out. Especially since I’m the most impatient person on earth. And $8 for a 4 ounce bottle of jojoba oil?! I paid 15 euro for a teeny tiny bottle here in Italy. Time for a trip to The States! I think a lot of people loved that oil. And the fact it’s being sold on ebay for insane prices is proof! Just wondering how the attempt minus the vodka went? It’s still steeping and should be ready in about 3-4 weeks. In the meantime I might try the fast method as well (described in the comments above). In any case, I’ll report back with all the results…. ooh, yum! I too loved the vanilla oil from the Body Shop as a teenager. I went looking for it a few months back and the new version is nothing like it! excited to try making my own! This sounds great! I love making my own body products and a homemade perfume (sans alcohol) would be awesome! Would be fun to try it with different herbs as well. Thanks for this idea. I love home made perfume . In Mauritius we actually plant vanilla and get them fresh ,so I will try your recipe . We also have geranium scented plants with which I will try . Congratulations again ! Wow…fresh vanilla! Sounds like a dream. I made a anti-mosquito spray with geranium rose oil and lavender and it works perfectly. I think the geranium scent is strong enough to keep them at bay. @Jillian In Italy This sounds very good and I will try it! Thanks! Hello. Thanks for your wonderful blog post. I make soaps and lotions, just thought I had to add that macadamia oil is my carrier oil supreme, being very similar to human sebum doesn’t irritate, refined mac oil has great shelf life too. Also I would use soy or rice bran oils to make the tincture, soy has long shelf life and rice bran has heaps of vitamin e which is not only great for skin but is a natural antioxidant preservative. Great post… Guess who’ll be buying a jar of vanilla bean paste! wow, I just spent close to fifty dollars on the vanilla beans and the oil and wasted it completely. I tried the one method someone had commented on cooking it all day. Let’s just say it doesn’t work. Please, anyone that decides to attempt this recipe, only go with the one posted. No short cuts or don’t waste your time or money. Oh well that’s the way it goes sometimes. So sorry to hear about your perfume not working out! I tend to agree that short-cut methods rarely have the same results as doing it the “long way”. Hope you try out the way I posted sometime with good results. Take care! I have my hand stumbled upon your wonderful post while googling out for methods of homemade perfumes..
Can you share with us what happened to the second method you tried ( less vodka) ?? can be used instead of the vanilla beans? Hi Layla. The second method turned out really well. I left it to steep for a few months and it has a really nice earthy fragrance. I personally wouldn’t use the powder. 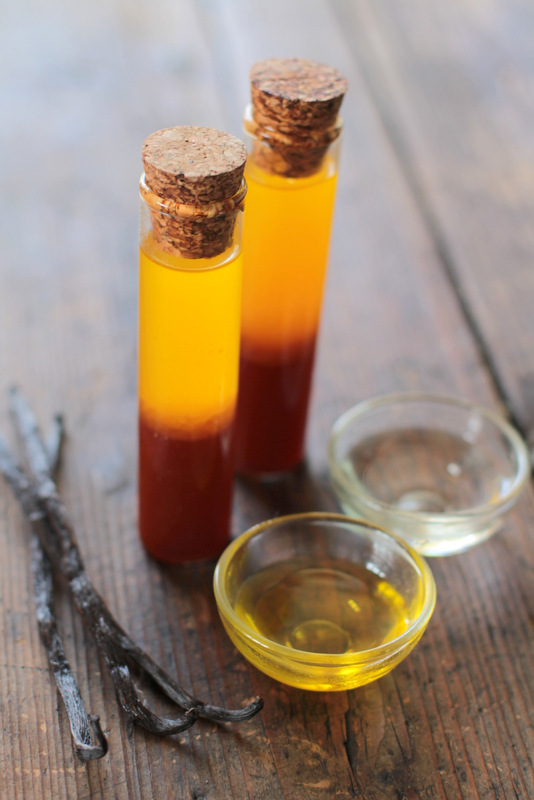 I think the best option to make a really good perfumed oil is to use raw natural ingredients. Makes it more expensive but really worth it! I am planning to try your methods for making your own parfume. I just have one question – how many hours will the scent approximately last in your experience, in regards to each of the two methods – the one with alcohol, and the one without alcodhol? Seeing as it’s not a commercially made scent it definitely doesn’t last as long or smell as strong. But in any case, I applied it once a day and that was fine. I don’t think so…gin has a very different scent. Sounds great! Is there any problem with staining clothes? I haven’t had any issues with stains but it is oil so I’m careful when I apply it.